Most rural farm family members are aware of the potential hazards on their farm. However, working alone, long distances from hospital or emergency services leaves a victim in a tenuous situation should an accident occur. A basic understanding of first aid methods is extremely important for farm families. Everyone on the farm should take a first aid and cardiopulmonary resuscitation (CPR) course. Always remain calm when responding to any emergency situation. First, size up the situation from a position that does not put you at risk of injury. Too often people rush into situations not thinking that they too could become victims. Look out for live electrical wires, toxic atmospheres etc. Is the victim alive? Is he conscious? Is he having difficulty breathing? Is the victim trapped in or under the piece of equipment, or in danger of further harm? Is the equipment still running? Are potentially hazardous fluids such as gasoline leaking from the equipment? Will approaching the victims endanger your life? Because overturned machinery may not be stable, it should be approached from the uphill side. Whether you immediately go for help or begin rendering aid depends on the type of accident, the severity of the injury and your ability to correctly administer first aid and/or CPR. If you provide aid first, your immediate concern should be respiration. If the victim does not respond, call for help. Always approach a victim from the direction in which he or she is looking. Otherwise, victims may risk further injuries by moving to watch you. Great caution should be exercised not to disturb the balance of the tractor or machine when it could further injure the victim. Tightly wrapped clothing that is not restricting breathing may actually be beneficial by restricting blood loss. Carefully evaluate this potential, especially when an amputation is involved. The best method to control bleeding is to put direct pressure on the wound and to elevate it above the heart. If this fails and you know the extremity pressure points (inside of the upper arm midway between the elbow and shoulder, or the upper inside of the leg in the groin area), you can use them to stop bleeding by pressing the artery tightly against the bone above the wound. For severely bleeding extremity wounds that cannot be controlled by any other method, the last option is a wide tourniquet, such as a belt, clothing or anything else that is strong and wide enough not to damage the tissues underneath (3-4"). It should be applied snugly 2 to 4 inches above the injury. If skin or an appendage has been removed, try to locate the amputated tissue for possible reattachment. However, do not delay the transport of a severely injured victim to look for amputated tissue. It can be sent to the emergency facility after it is found. Wrap appendage in a dry, sterile dressing or towel. Secure the towel with adhesive tape. Place the package in a cooler on top of a sealed bag of ice, for transport to the hospital. Never allow an amputated part to be submerged in or even come into contact with ice or water. Never use dry ice to keep an amputated part cool. Once the situation is stabilized, or if you choose to go for help before rendering aid, seek help from trained medical professionals through the Emergency Medical Services (EMS). Even if you are not sure that medical attention is necessary, it is better to activate the emergency medical service and later cancel the request when you are positive they are not needed. Planning whom to call and how to give easy-to-follow directions in advance is the most effective preparation for farm accidents. Giving directions to any part of your farm may seem a simple task, but experience has shown that mileage estimates, landmarks, road and bridge conditions, and turning directions do not come easily when people are highly excited or distraught. If you do use landmarks, make sure they are well known, easily visible and permanent. They must meet these requirements whether it is day or night and regardless of the time of year. Having someone meet the rescue personnel at the entrance to your farm or another specified point and lead them to the accident site. Be sure the EMS knows of your intentions. This can save critical time. Do not assume all ambulance and rescue vehicles will come from the same direction, or that they are housed together. Know specifically where each person you call is located and have specific instructions for each situation. If you were not alone when you discovered the accident and another person went for help, control blood loss and make sure the victim can breathe. This may be all you should attempt if you are not familiar with rescue procedures. Trained personnel should conduct removal and rescue under controlled conditions. The most likely reason for attempting to remove a trapped victim is to avoid further injury from a clear and immediate hazard. More probable is a situation where fire or explosion is a possibility, but the odds could be significantly reduced without moving the victim. Recommended actions include turning off the ignition and any other electrical accessories such as lights; keeping fire sources such as cigarettes and flares well away from the area; and disconnecting the machinery's battery ground. If you carry a fire extinguisher, have it on the scene. Watch for battery fluid leaking onto the victim. Leaking fuel could be channeled or dammed up away from the victim. These methods also could be used to keep battery acid or other dangerous liquids out of contact with the victim. Hot oil from the hydraulic systems or transmission also may pose a problem. The "clothes drag" method is preferred because the head is supported while being moved. Do not pull the body sideways. When providing care, it may be necessary to roll the victim over onto his back to clear an airway or evaluate breathing. When rolling the victim over, the head, neck and torso should be moved together so that no twisting occurs. This can be difficult for one person to accomplish. Many types of first aid kits are available to the public. Place a small, regularly maintained kit on every major piece of equipment, truck, or auto. Display a larger kit at each farm building, shop, or home. If a person becomes submerged in grain, begin rescue operations as rapidly as possible. If the person is totally covered, turn on the dryer blower and move some air into the bin. Always assume that the person trapped in the grain, even if completely submerged, is alive. The most successful way to rapidly remove a victim is to cut large holes around the base of the bin, approximately 5 feet up from the base. (Always beware that if you cut too many holes, the bin may collapse on you.) Cutting holes reduces the volume of grain from the bin in the shortest period of time. Gain access into the grain bin sidewalls by using the front-end loader of a tractor, an abrasive saw, or an air chisel. Cutting torches should be a last resort because of the dangers of fire and explosions from dust and fumigant residue. Using a drum with both ends cut to drop around the victim is another rescue technique. The drum placed around the victim can reduce the force of the grain on the trapped victim. When you must enter the grain bin, have several people assist you from the outside. At least two people should be available. Enter with a rope and safety harness so they can lift you out in case of an accident. Do not attempt a rescue in an oxygen-deficient atmosphere. Call your local emergency rescue team. They have the training and equipment to do the job safely. Always use a SCBA to enter Oxygen deficient atmospheres. Disconnect the PTO shaft from the rest of the tractor, and turn the shaft counterclockwise to unwrap the tightly wrapped cloth and tissue that may be around the shaft. This material will not slip off the shaft after the PTO shaft is disconnected, but must be unwrapped. Place the Power Takeoff drive unit in neutral and turn the PTO shaft counterclockwise to unwrap the person from the shaft. This may require using a large pipe wrench or putting a small shaft or bar into the yoke of the Power Takeoff unit and turning with considerable pressure. 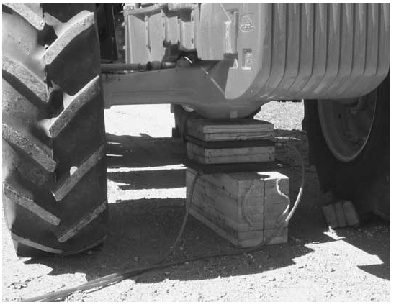 You may be able to disconnect the hitch pin that attaches the trailing equipment to the tractor and move the tractor forward to pull the PTO shaft apart. After the PTO shaft separates into two parts, you will have to turn the shaft counterclockwise to remove the victim. If the shaft is solid, the rescuers may have to cut it with a cutting device such as a portable power grinder, hacksaw or oxyacetylene torch. If there are combustible materials in the area, rescuers should be extremely careful when using any type of flame-producing equipment, or even portable grinders that produce sparks. 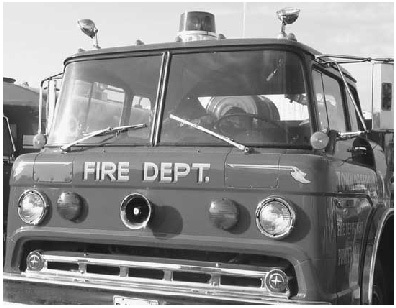 If such equipment must be used, adequate fire equipment must be readily available in case a fire starts. If explosive products such as gasoline may be have been spilled in the area, open flame must be ruled out. In this case, rescuers and observers should be alert and not smoke in the area. While the victim is being removed from the Power Takeoff shaft, other rescuers must provide life support to the victim and monitor his vital signs continuously Extrication is only the first step of saving the victim's life. If an arm, foot, leg or other part of the body was amputated, it should be located and handled properly for possible reattachment and transported with the victim. Fire is a threat in an overturn situation if there is spilled fuel present. A fire hose or ABC-type extinguisher should be available throughout the rescue. Consider alternative methods before using oxyacetylene cutting equipment to free a victim. Shut off the tractor engine. Even if it isn't running, rear wheel movement could start it up. If the ground is soft, it may be possible to dig the victim out from under the tractor. Always block or crib the machine to prevent it from tipping and causing more injuries. Lifting the tractor is the best way to deal with rollovers of large, modern tractors. A second tractor or a tow truck will be needed to perform the lift. Place cribbing under the tractor as it is raised. Nonessential rescuers should stand well clear to avoid injury if the cable or chain breaks. 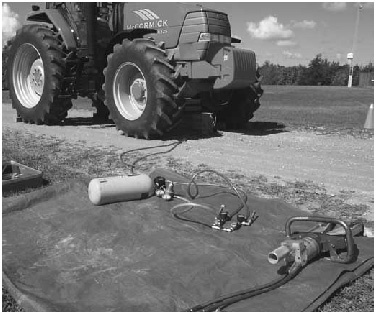 If a victim is pinned under one side of a small tractor, eight to 10 people may be able to roll the machine enough to free the victim. Rescue personnel must use a self-contained breathing apparatus to safely enter a manure storage pit or tower silo. Confined space entry procedures must be followed. Also the rescue personnel must use a lifeline and have assistance from a back- up crew. Restore ventilation to facilities with beneath the floor manure storage as rapidly as possible. Run the blower on the silo if it is still operable. Open windows and doors, activate the buildings ventilation system, or use smoke evacuation equipment. If there is a possible of reviving a victim cardiopulmonary resuscitation procedures should begin immediately. Always assume that any downed power line or any piece of equipment in contact with a power line is energized. If you have not been trained to handle high voltage lines call 911. An untrained individual should attempt rescue only if the response time is dangerously long. Wear rubber soled boots and nonconductive gloves. Use a non conductive material to remove the power line. If the victim is in contact with energized equipment, it will be necessary to push or pull them away. A piece of dry, nonconductive rope can be used for this purpose. Check for breathing as soon as the victim is freed from electrical contact. Start artificial respiration immediately if required. A doctor should examine any one who has received a high voltage shock as soon as possible.